Note: This is a sponsored post. I received the stain for this project at no charge. As all of you know, I regularly try new products and review them here. I had already decided to use this product for these shelves when the offer was made. My opinions and experiences are honest and my own. 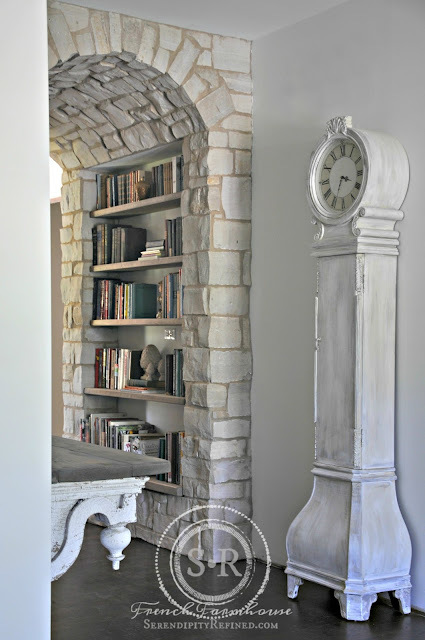 As you can tell from the first photo in this post, the shelves between two stone walls which would have made it extremely difficult to drill the stone and install posts for them to sit on so we decided to install them as floating shelves instead. 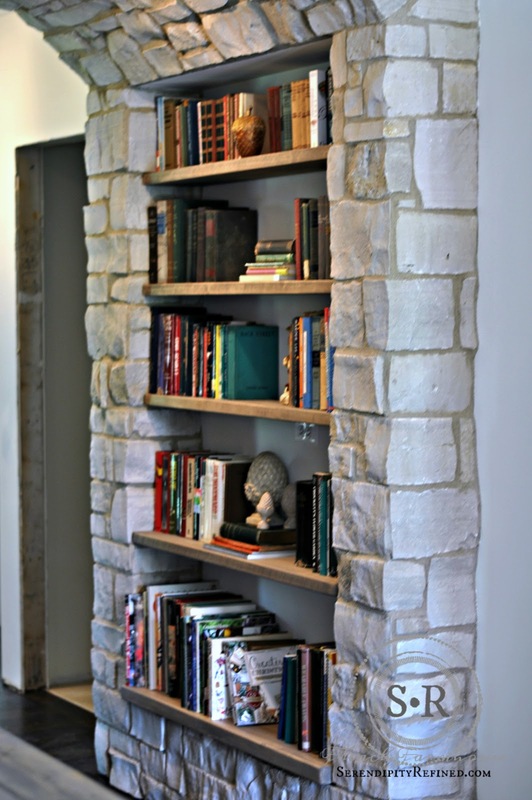 The shelves are made out of 1 1/2 inch poplar which was cut to size and sanded smooth. First, we found the studs in the back wall and measured and marked the location of the shelves with pencil. Then, we drilled pilot holes 2 1/2 inches into the stud and screwed 10 inch bolts into the holes to a depth of 3 inches using a speed square to make sure that they were level and square. Once the bolts were installed. We used a cutoff saw to cut the heads off of the bolts. Yes, there are sparks! Always use a tarp and wear eye protection when doing these types of projects! 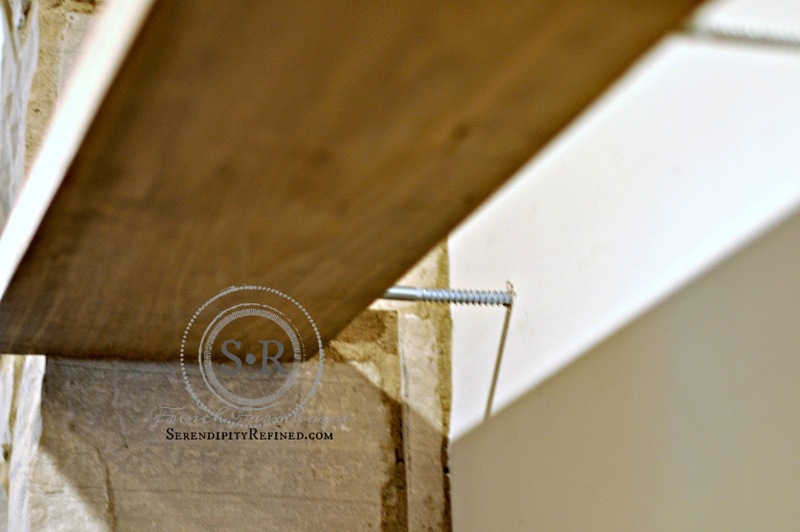 After the heads of the bolts were removed, we held the shelf up to the bolts and marked the edge where the bolts met the wood. 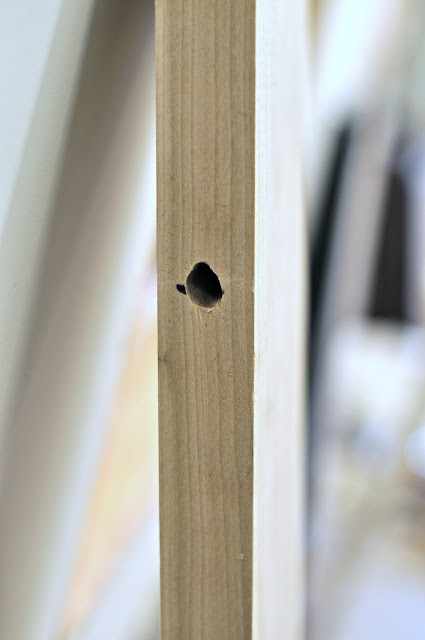 We drilled holes into the wood to a depth of about 5 inches. With the holes drilled, it was time to stain the shelves. 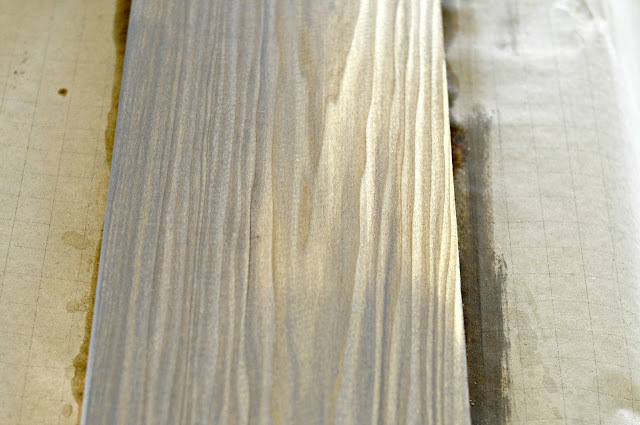 For this project, I wanted a light, warm, driftwood gray color for the poplar wood to match the finish on our alder front doors and I was considering a couple of options for how to achieve the look that I was after. Way back in winter during the Vintage Shop Hop, I stopped in at From Shabby To Fabby and was talking about my vision for these shelves. My sweet new friend, Karri, asked if I had heard about the new, "one-step" Stain and Finishing Oil product from Fusion Mineral Paint. Once she explained that it was a one step process, I knew that it was perfect and I couldn't wait to try it and when she offered me a can, I jumped at the chance! I sanded the shelves and then applied a prestain product to the wood. 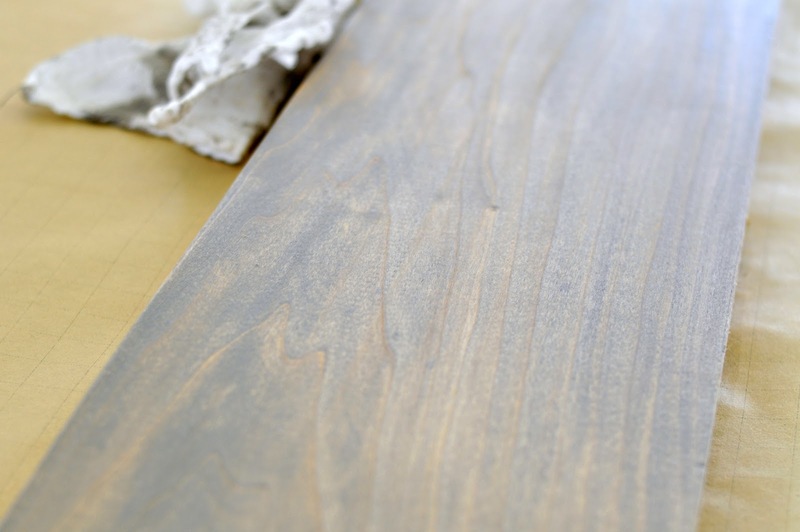 When working with wood that has a very open grain (like pine or poplar) it's important to use prestain to help even the porosity so that the stain doesn't get "blotchy". After allowing the prestain to dry for ten minutes, I wiped the Homestead House Stain and finishing oil on with a small piece of cotton cloth and allowed it to dry for a few hours. I could have used a brush but I wanted a very light coat. The color is exactly what I wanted. To install the shelves, I simply slid them over the bolts. 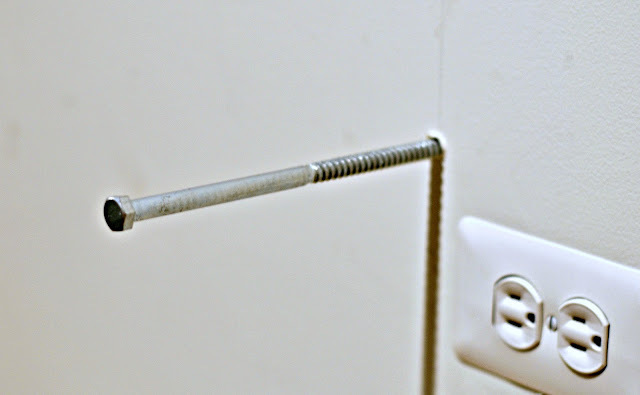 If necessary, adjustments to the bolts can be made using a pipe wrench to bend them slightly up or down at the point where they meet the wall. 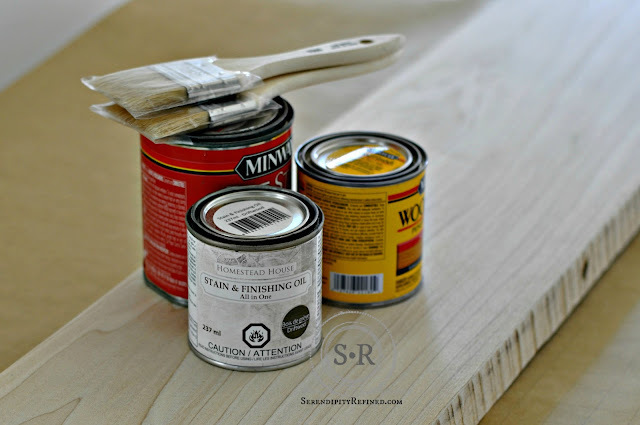 This is the first of two methods that I'm using to make floating shelves here at the farmhouse. I'll share the other method when we install the shelves in the master bedroom closet. I love the way these DIY floating poplar shelves turned out in all of their soft gray, driftwood colored glory! 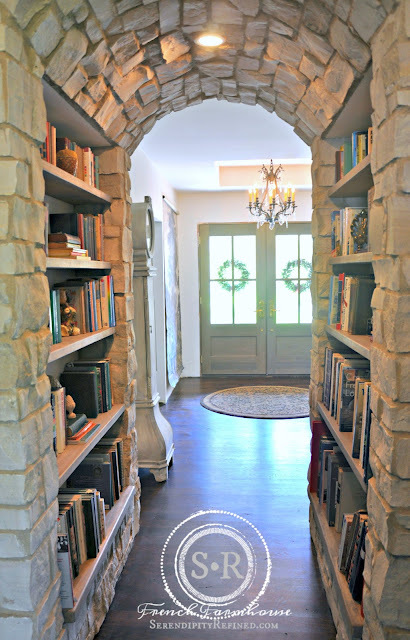 .....I also love the fact that the dining room table is no longer covered with stacks of books...not that I'm entertaining any time soon since we still don't have a functional kitchen...more on that later. Thanks so much for your patience and for continuing to read.